iOS 5 beta 3 is now available for download. If you’re a registered iOS Developer, you can download iOS 5 beta 3 for iPad 2, iPad, iPhone 4, iPhone 3GS, iPod touch 4G, iPod Touch 3G and Apple TV from the iOS Dev Center. iOS 5 beta 3 comes with a Build number 9A5259f. The iOS 5 beta 2 was posted three weeks ago. Along with the 3rd beta, apple has also pushed a new iCloud for Lion beta, iTunes 10.5 beta 3 and Xcode 4.2 Developer Preview 3.
iOS 5 was unveiled last month at WWDC 2011 which beings 200+ new features. We have already listed iOS 5 Features. Prominent features includes Reminders, enhanced Mobile Safari, iMessage, and OTA firmware updates. iOS 5 beta 3 breaks the beta 2 jailbreak, so if you’re jailbroken wait for the jailbreak update. iOS 5 final is set to be released with Next Generation iPhone this Fall. 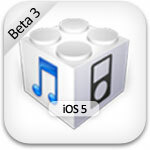 If you’re registered iOS developer you can download iOS 5 beta 3 from the iOS dev center. iOS 5 beta 3 requires iTunes 10.5 beta 3 to Sync. If you’re a registered developer, head over to iOS Dev Center and start downloading.